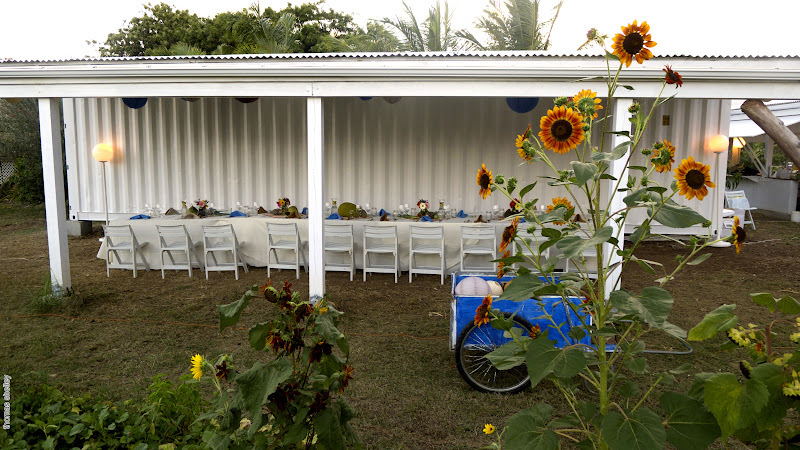 Our small and beautifully diverse Caribbean farm run by two artists is a unique setting for your wedding, banquet, or other event. Please note, we maintain a strict no-smoking policy on all grounds and in all facilities. Check out some of the photos and stories below, then contact us to see how we can be a backdrop or focal point for your special gathering or occasion. In 2011 we hosted a charity wine pairing dinner for twenty guests with celebrity Chef Ana Sortun. Using 95% ingredients from the ARTfarm or otherwise locally grown items, she created a five-course menu with a Middle-Eastern theme. Photos by Thomas Shelley. The warm reception we received for this event inspired us to begin hosting ARTfarm-to-Table Dinners on a more regular basis. The first of these was on May 28th, 2011. 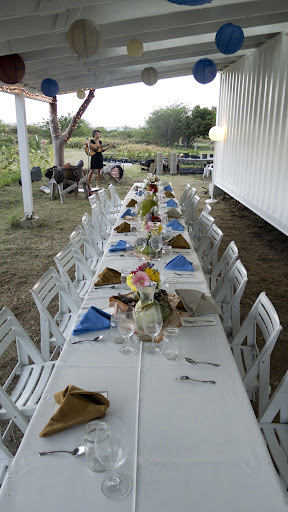 Please contact us if you’re interested in attending one of our ARTfarm-to-Table Dinners! ARTfarm owners/farmers Luca and Christina were married under a giant tamarind tree in the pastureland around the farm in 2004, and held our reception in the front yard of the historic greathouse at Longford. Since founding ARTfarm at this location in 2009, we’ve built more farm structures that also lend themselves to gatherings and celebrations. We hosted Amy and Justin’s wedding reception in January, 2012. We work with your caterer or help you find a local chef who can work with available ARTfarm ingredients to create a farm-to-table menu for your celebration. We can help direct you musicians, party rentals, and great photographers! We also have a limited number of vacation rentals on the property to host you or some of your out-of-town guests. The tiny mighty ARTbarn Gallery is available for art exhibitions. Work can also be displayed in the farmstand and surrounding areas. Eventually we would like to see some large outdoor sculptures in the pastures. Please contact us if you are interested in showing your work at ARTfarm on St. Croix! School groups are welcome for a tour of the farm. We prefer small groups of kids, at maximum up to 20 kids, with at least one adult supervising for every 4-6 kids (depending on age and maturity level). All group tours of ARTfarm must be scheduled in advance, and are subject to cancellation if weather requires it. We usually include cultivation areas of the farm but not the livestock areas in farm tours. School tours should start no later than 9am and generally run about one hour. Please let us know ahead of time if the students have specific interests or topics we can cover! Individuals who’d like a short overview or to ask a few questions should visit us during farmstand hours and we’ll do our best to accommodate you. Once or twice a year, we hold what amounts to a barn-raising. These events are by invitation only. Between 20 and 60 of our neighbors and friends come together to help us with large and small projects, from painting to plant care to construction to pasture mowing. At the end of the day we come together for music and a big supper prepared by one of our local restaurant chefs using local ingredients. Hey Bonnie. Sorry to say we don’t have any dinners planned this year. The drought has limited our production levels and we have had to put our energy and free time into water conservation and fire prevention efforts. Drought conditions are predicted to repeat this year more severely, unfortunately. We are hoping the cycle will shift next spring and bring us the rainfall we are missing.